In recognition of June as Cancer Immunotherapy Month organized by our colleagues at the Cancer Research Institute (CRI), the Society for Immunotherapy of Cancer (SITC) celebrates the numerous advances and positive steps taken in moving the field forward. We applaud all of the researchers, practitioners and advocates who have demonstrated an unwavering devotion to improving outcomes for cancer patients worldwide. Annual SITC Fundraiser at House of Blues Chicago with The CheckPoints, recognizing the advances made in cancer immunotherapy research, Sunday, June 4 at 8 p.m.
Another event taking place next month is White Out Cancer Day on June 16. We ask those of you who have a SITC Cure t-shirt to take a selfie and tweet at the society (@sitcancer) using the official hashtag #WearWhite or email the photo to communication@sitcancer.org. Show your support on the specific day, or any day during June. If you do not yet own a Cure t-shirt, you can order one here. As the field continues to grow and expand, a major priority of the society is to support and help develop the next generation of leaders. If you are an early career scientist looking for a unique and amazing new team-based research (and business development) opportunity to help the field, apply now to the SITC Sparkathon. Participants will meet on Aug. 28-29, for a two-day retreat in a “Technology Hackathon” meets “Shark Tank” format to explore the hurdles and challenges facing the field of cancer immunotherapy. Applications are accepted until June 16, so apply soon. 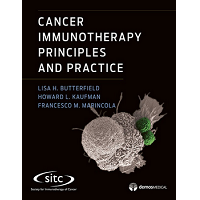 Finally, the society is excited to publish its first textbook, Cancer Immunotherapy Principles and Practice. The SITC textbook, an authoritative reference presenting the history, supporting science and mechanisms as well as the current state of cancer immunotherapy, is now available for pre-order. SITC members are eligible to receive up to a 25 percent discount and free shipping. Login to your SITC CONNECT account for more details including the promo code, or stop by SITC’s exhibit booth #2015 while in Chicago. Thank you for your continued support of the cancer immunotherapy field.